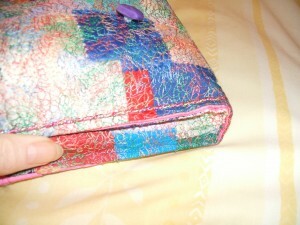 I’ll tell you the story of my little coloured bag! This was what I call a Home project. Something I did for me alone about twenty years ago. We were invited to a summer wedding and I had chosen a jumpsuit in Cornflower Blue Silk. My Hair was in full autumn glory with not a hint of grey, so I chose not to wear a hat. I needed to introduce colour to break my long line of blue. 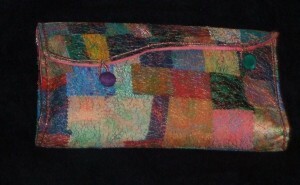 Large enough to hold glasses case, purse, keys, tissues and make-up. Over time I had collected a box full of fabric sample swatches, some not much bigger than a large stamp, I used them for matching colours, textures and sometimes to play with when looking for inspiration. 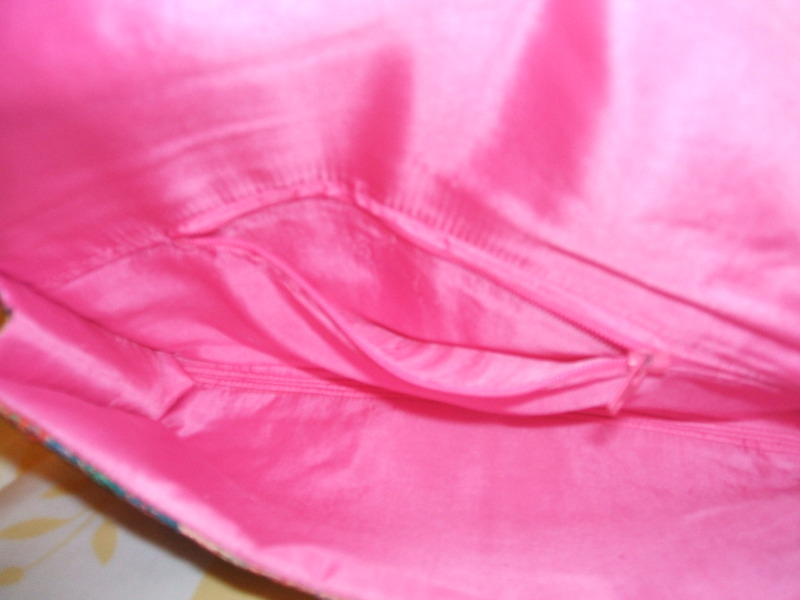 I selected all the squares of silk, satin and polyester and dropped them like snowflakes on the worktable. I ran my fingers through them like a good cook, making pastry. They formed a patchwork collage that pleased me. The idea was born. Since my outfit was soft and flowing, I wanted my bag to be soft as well. Using a mid to heavy weight Vilene interfacing for the base or backing fabric I scattered scraps of Bondaweb* randomly across the surface. Next I placed the squares of fabric across the surface, randomly overlapping until the backing fabric was completely covered. I laid a layer of baking parchment carefully on the surface making sure not to move the squares. Then it was over to the ironing board, which was already covered in a layer of baking parchment. 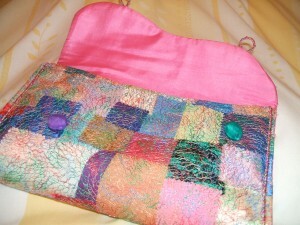 A hot iron moved gently over the paper sandwich allows the Bondaweb to dissolve and bond the layers of fabric together. Once the work had cooled I removed the baking parchment making sure not to pull any squares off the backing. Using a Madeira variegated coloured thread in both the bobbin and needle of the sewing machine, I dropped the tension feet in the foot-bed to loosen the tension. Next the fabric was placed in an embroidery hoop reverse way up, and the hoop placed under the sewing foot with the right side of the fabric facing upward. With the feed teeth down, the loop was moved along by my hands. I worked in small circles moving at a steady even pace until I had all the area with it hoop covered. Removing the embroidery ring and repositioning the fabric within the circle I worked until the whole piece was covered in tiny circles. This secured the squares and strengthened the fabric. 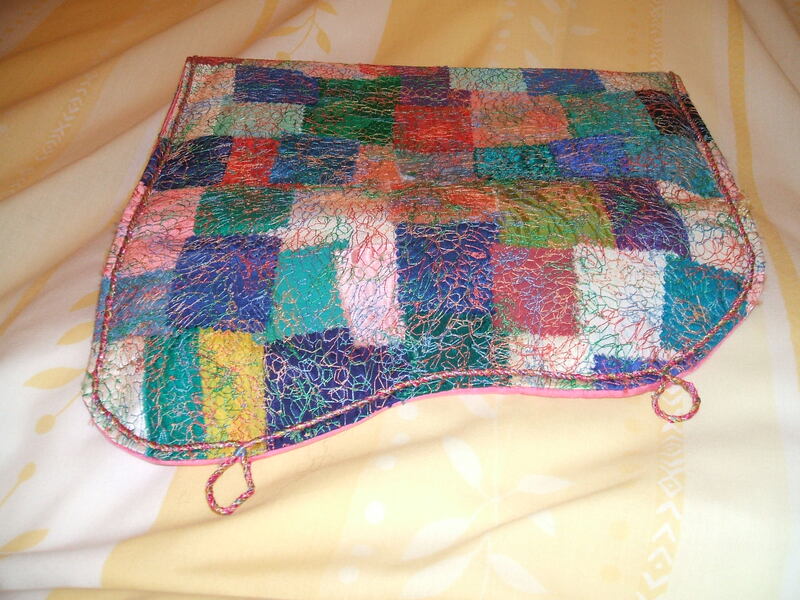 Now I had a length of unique patchwork fabric to work with. I cut a rectangular piece to form an envelope shape. 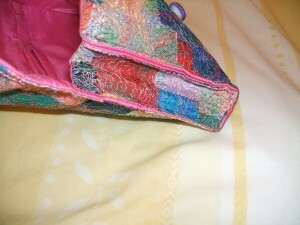 Once I had decided on the exact size, I shaped the flap end to add interest. Then I cut two strips to form side gussets. Now I needed lining. The previous day I was shopping and came across a rack of bargain scarves. I love scarves for adding interest to a plain neckline. There were plain silk squares for £1! Can you believe it? I bought… yes you guessed it… I bought two three! They were the colour of my £ sign. One I used as the lining for the body of the bag, the second I cut to making lining strips for the gusset pieces and with the remainder of the second I made an internal zipped pocket for the bag. 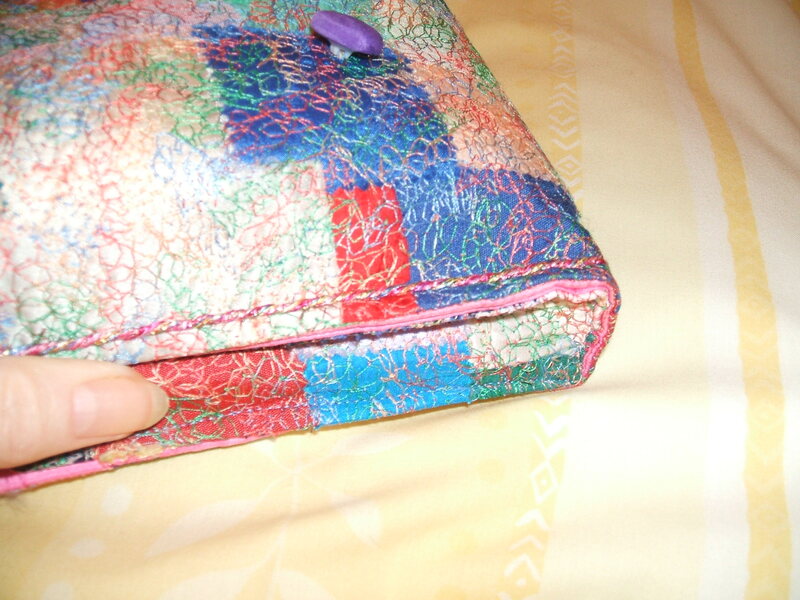 I covered two buttons to use for closing the bag – one purple and one green. My hand & machine made cord used to trim and add finish. The back and flab of the bag showing the cord edging and how I used it for button loops. *Bondaweb or Wondaweb is a fine, fusible fleece which bonds fabrics together quickly and easily, providing a natural, firmly joined finish. It is sold by the metre, on a roll of paper like greaseproof. For work like this I use an old ironing board cover and plenty of baking parchment to save accidents, I don’t want to end up with adhesive stains on the good cover. And MIND that Iron! 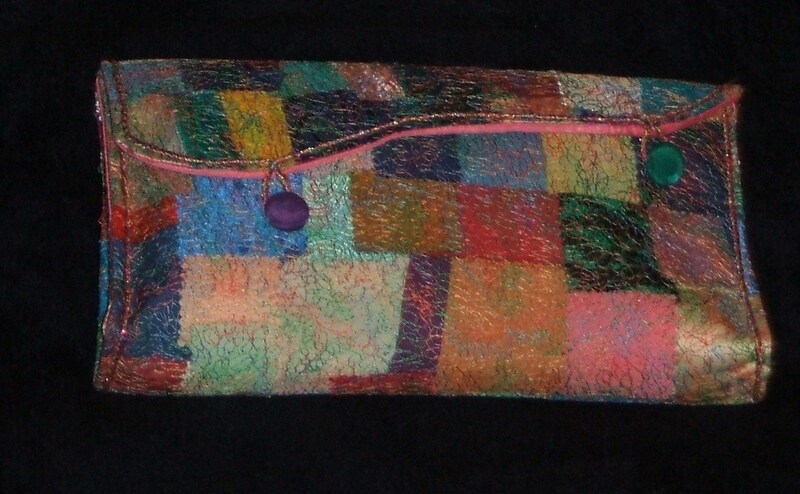 This entry was posted in Crafts on November 11, 2009 by Grannymar.